I have to thank my friend Ali for being the inspiration to this recipe. Knowing strawberry shortcake is her favorite, I wanted to bake something for her birthday - but didn't think an entire delicate cake could withstand my morning Manhattan commute. A quick Pinterest search yielded the perfect solution: Strawberry-Shortcake Cookies, miniature, scone-like renditions of a universally loved dessert. Strawberries are all the rage at farmers markets right now (yes, I used rage and farmers market in the same sentence.) Walk past those little cartons teaming with the fresh juicy berry and just when you've convinced yourself you don't need to spend $8 on something that will last 3 days, you catch a whiff of their sweet fragrance and are a goner. Luckily for me, my local strawberries had a mission! I decided to make Martha Stewart's "portable version" of the classic dessert, but lightened up the recipe a bit. Generous portions of butter and heavy cream would make an uber rich cookie, so I substituted the heavy cream for nonfat Greek yogurt and skim milk. The substitution worked wonderfully- an evenly split switch of the ingredient (1/3 cup yogurt, 1/3 cup milk) preserved the fluffy interior of the cookie but adhered to the scone-like consistency. I also added a small drop of vanilla, which definitely enhanced the sugar cookie-like flavor. If the nutritious value of this recipe isn't really important to you, definitely top your cookie with whipped cream or crumble over vanilla ice cream. Important note: these cookies must be eaten immediately after baking! 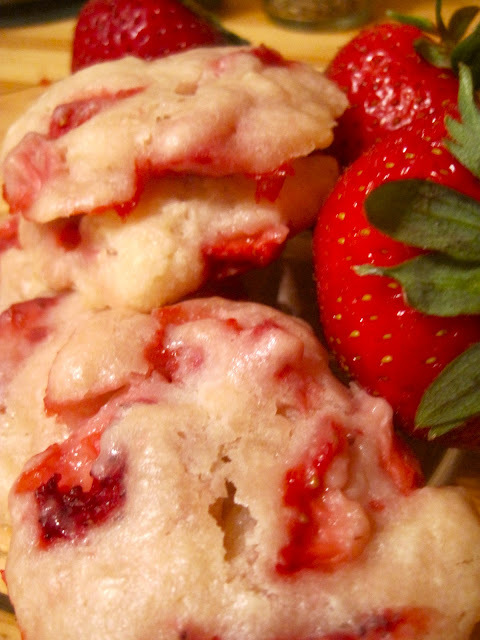 Unfortunately, the watery nature of the strawberries softens the cookies, so after a few hours they get a bit damp. Soggy is too extreme of a word, but that scone-like crust is definitely gone. Even in this state though they still taste good- almost like a strawberry Christmas cookie. I blotted my diced strawberries before adding to the batter to remove excess liquid, but clearly more remained. 1. Preheat oven to 375 degrees. Combine strawberries, lemon juice, and 2 tablespoons granulated sugar. Whisk together flour, baking powder, salt, and remaining 7 tablespoons granulated sugar in a large bowl. Cut in the butter with a pastry cutter, or rub in with your fingers, until mixture resembles coarse crumbs. Stir in yogurt and milk until dough starts to come together, then stir in strawberry mixture, and finally vanilla. 2. Using a 1 1/2-inch ice cream scoop or a tablespoon, drop dough onto baking sheets lined with parchment, spacing evenly apart. Sprinkle with sanding sugar (optional), and bake until golden brown, 24 to 25 minutes. Transfer to a wire rack, and let cool. Cookies are best served immediately. They look so very yummy! Thank you for sharing the recipe.